I’ve had tofu since being a child. I remember standing next to the stove and picking at it straight from the pan before it made it to the dinner table, it seemed like a treat! A lot of people think it’s bland but not when it’s cooked in this way. I’ve always liked it best marinated in miso, garlic and soy then fried. It becomes crispy on the outside and still soft on the inside. Tofu is a great source of protein and although I’m not vegetarian I do eat it regularly. It is especially good with a vegetable stir-fry and udon noodles but you could also have it with rice. I also found the texture of tofu is a good addition to vegetable purées and an easy way to add protein to your baby’s diet. It is soft enough for babies to eat from a young age and you do not have to cook it (check instructions on your tofu pack), you can just stir it straight in. It went down really well in my daughter’s favourite vegetable purées. I think it was actually the first protein I introduce to her. Please check the courgette and red pepper purée with tofu recipe below. To prepare the tofu marinade mix Miso and crushed garlic in a bowl. Add soy to loosen marinade. Cut the tofu into cubes approx 1.5 cm big. Put approx 3-4 cubes aside for baby recipe below. Stir the tofu in the marinade and make sure it in coated all over. Chop all the vegetables so they are ready to cook. Put a pan of water on the hob to boil for the noodles. 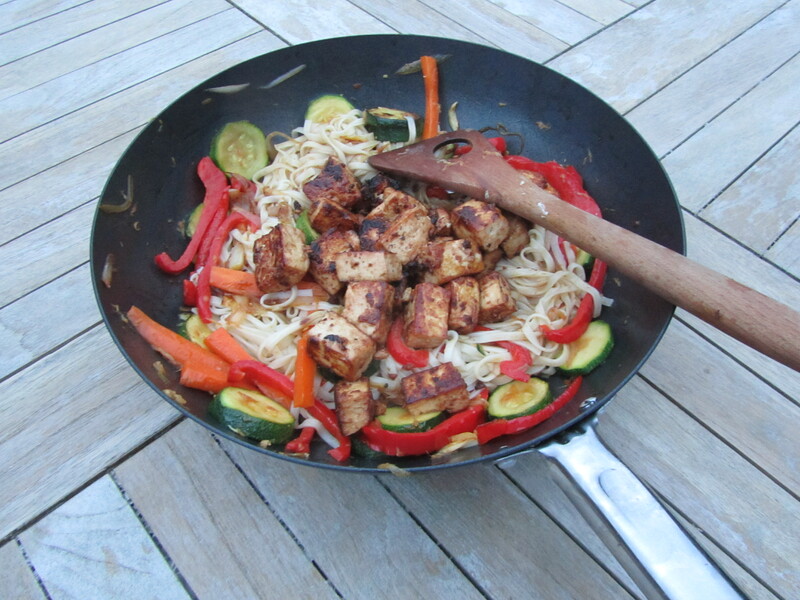 Fry the tofu in a hot pan with vegetable oil. Let it get crispy on one side before tossing. When all sides are nicely browned it is ready. Set aside. Cook the noodles to packet instructions. In a wok fry the shallots in vegetable oil, followed by the garlic and ginger. Add the red pepper, carrots & courgettes and fry until slightly undercooked. Add noodles and soy sauce to taste. Top with the tofu and serve. Boil Courgette and red pepper until cooked through. Drain, and reserve the cooking liquid. Purée the vegetables using a hand blender or food processor until smooth. Add a little of the reserved cooking liquid to correct consistency if needed. Crumble in the tofu for a little texture.